There are two items of interest here, firstly why is there no record of the ‘enclosure’? and secondly, whilst plausible how accurate is Major C. H. Smith’s theory about the origin of the place-name? Probably the question of the place-name is the shortest to answer? According to ‘The English Place-Name Society’ the first recorded evidence for the place-name appeared in the Domesday Book of 1086 as Magnetona/Manitona. Then over the next 262 years it mutated through various stages until in 1348 it’s recorded in the Assize Rolls as Manaton. It is suggested that the name contains the Old English word maene (Gover et al. pp. 481) which roughly translates as ‘common/public/universal., (Clark Hall, p. 226.). So given the translation as meaning common etc. this may indicate, again as suggested by the English Place-Name Society; “some natural feature belonging to the whole village or community, or possibly in some cases to some particular object marking the boundary between two or more estates.” – (Gover et al. pp. 246). So, if Major Smith’s theory is correct then maen or maene refers to a “natural feature belonging to a community” and dun refers to a ‘hill or moor’ (Clark Hall, p. 90.). Thus we have literally ‘the hill/moor of the natural feature belonging to the community’. What that “natural feature” may be is anyone’s guess? But as always with place-names there is always another alternative. It has been suggested that the two place-name elements are Manna and tun, Manna being a personal name and tun being a farm/manor/enclosure (Clark Hall, p. 350.) which presents us with the ‘farm/manor/ enclosure belonging to someone called Manna’. (Ekwall, p.312.). You pays yer money and takes yer choice. Onto the enigmatic “enclosure of an elliptical form,” where is it now? There is another comment regarding the circle which appeared in J. G. Croker’s ‘A guide to the eastern escarpment of Dartmoor’ written in 1851: “At some distance below the village in a field called Hookaway, was a noble circle or cyclopean enclosure of stone, considered by Colonel Hamilton Smith as one of the finest in England. In 1849 it was partly destroyed for the purpose of making a wall, and in 1850 it was wholly destroyed to make a partition between two fields, leaving only six stones to denote it s once venerated site. ” – p.12. Thanks to Mr. Croker it’s now evident what happened to the circle, it went the way of numerous Dartmoor’s ancient monuments – recycled for other purposes. But, the next question, where was the circle located? According to Croker in a field named ‘Hookaway’ so the next logical port of call must be the Manaton’s tithe map and apportionment of 1842. 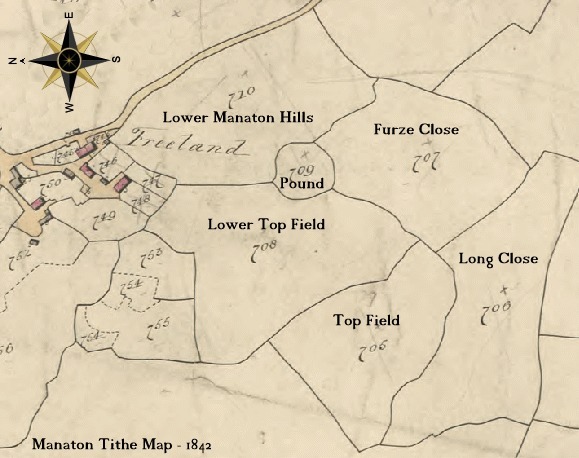 Although I could find no mention of ‘Hookways’ there is a small circular enclosure simply called ‘pound’ on land belonging to Manaton Hills – could this be the circle? If the circle was in evidence at the time of Rowe’s writings then this may well be the self-same circle as denoted on the tithe map of 1842? Now we have another conundrum – was the circle a ritual monument or simply a livestock pound or indeed a ritual monument that had been converted into a livestock pound? Sadly as it has long gone that answer must remain in the dim and distant past. One last question – who was responsible for the destruction of the circle? Thanks to ‘The Book of Manaton’ the answer lies within. There was a notebook complied sometime in the mid 1950s by a Miss Everard in which see notes; “One half is left of the so-called pound at Lower Hills, on Town barton farm – the diameter (or perhaps it would be more correct to say the chord) is now about a hundred and twenty feet, but in 1828 it has an elliptical form, and was very perfect, with a diameter of a hundred and thirty eight feet by one hundred. The wall is of large rough blocks, very carefully set, and has a height of about four feet.. I was however informed that stones of a greater size existed in the section destroyed, their dimensions being six feet in height and about three feet in breadth and thickness. Formerly a row, consisting of thirty or forty stones, four feet high, extended up the filed to the east of the enclosure, these stones touched each other – But two are left standing… I seem to have this on my mind!! Large elliptical pound ruthlessly destroyed in 1849 by the rector. It is situated in the middle of several fields on Town Barton.” – p.12. The rector at that time would have been the Reverend C. Carwithen who has also gone down in history for once removing Manaton’s churchyard cross because of the associated so-called pagan practices. Baldwin et al. 1999. The Book of Manaton. Tiverton: Halsgrove. Croker, J. G. 1851. A guide to the eastern escarpment of Dartmoor. Exeter: A. Holden. Ekwall, E. 1980. The Oxford Concise Dictionary of English Place-Names. Oxford: Oxford University Press. Gover, J. E. B. (et al.) 1992. 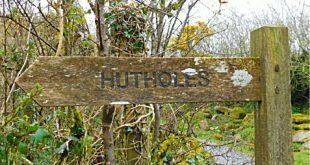 The Place Names of Devon. Nottingham: The English-Place Name Society. Rowe, S. 1830. Antiquarian Investigations of the Forest of Dartmoor. Plymouth: S. Rowe.